In small nonmetal bowl, combine all marinade ingredients except oil; mix well. Slowly add oil, beating with wire whisk until marinade is thick and well blended. In nonmetal container or resealable food storage plastic bag, combine olives, mushrooms and cheese. Add marinade; cover and refrigerate at least 12 hours or overnight to blend flavors. When ready to serve, cut salami slices in half. Roll slices into small cone shapes; spear with cocktail toothpicks. Line outside edge of large serving platter with lemon leaves. 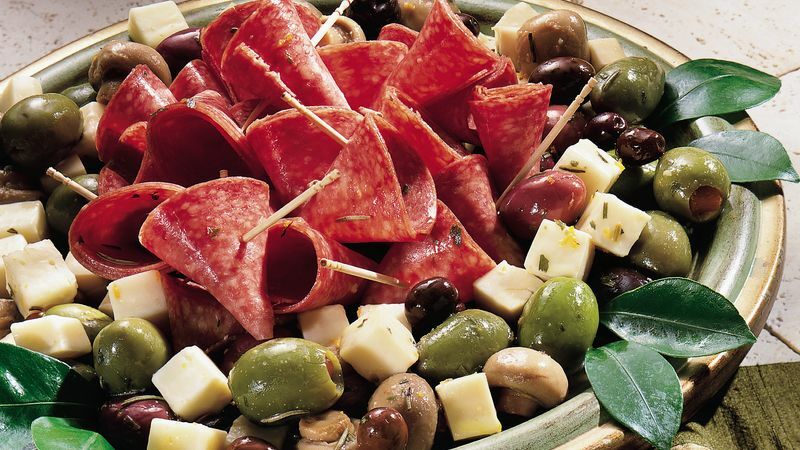 Arrange salami in center of platter. Drain marinated olives, mushrooms and cheese, reserving marinade; arrange around outside edge of platter. Drizzle 1 to 2 tablespoons of reserved marinade over salami. (Discard remaining marinade.) Tuck several lemon leaves among olives, mushrooms and cheese.